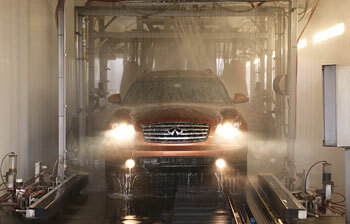 Landis Wash and Lube is a full-service, automatic car wash and oil change center. Our state-of-the-art, soft cloth, brushless car wash tunnel offers such features as a pre-soak, bug remover, wheel cleaner, foaming bubbles, undercarriage cleaner with rust inhibitor, clear coat polish, tire shine, and high-powered blow drying system. This same car wash system was recently purchased by Mercedes Benz for use in their manufacturing facilities, attesting to it's safety and effectiveness. Customers may choose to ride in their car, as it is propelled through the car wash tunnel, or may wait in one of our air-conditioned waiting rooms and enjoy television and refreshments. Children may watch the cars being washed in the tunnel, through several large windows in the waiting areas, or may entertain themselves with puzzles and coloring books. Car interiors are cleaned by hand, including dashes and center consoles, windows, cup holders, carpets and mats. Our finishing touch is a hint of air freshener and final hand drying of the car. We also offer many auto detailing services, from an "express" hand wax to a complete full recon. Many of these services can be done while you wait, with no appointment necessary! Our wide range of maintenance services includes everything from a Full Service Oil Change to tire rotations, coolant flushes, and transmission services. We offer many replacement items, such as wiper blades, batteries, light bulbs, and plugs and seals. Additionally, we are now proud to feature American Racing Wheels sales and Dent and Ding Repair. Most of these services do not require an appointment, as well, and are done while you wait, in a matter of minutes. 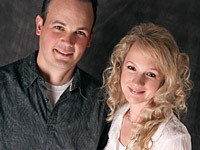 Tim and Ami Landis welcome business owners and administrators to inquire about our wonderful discount program for corporate cars, and organizations of all shapes and sizes to find out more about our hard-to-believe, hassle-free fundraising program! We also offer senior discounts and AAA discounts! 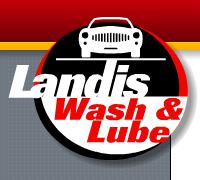 Landis Wash and Lube is one of the only car wash and lube centers, in Lancaster County, where the owner is present daily, working on your car. We offer state-of-the-art services and impeccable quality in an old-fashioned, "mom and pop" business atmosphere. It is our goal to exceed your expectations. Every time.